Home > crafts, Go Texan Day, Houston Livestock Show and Rodeo, sewing, THAT mom > Go Texan Day Resolutions Met! Go Texan Day Resolutions Met! Those of you not from Texas (more specifically, Houston) probably have no idea what a “Go Texan Day” is. Basically, the Friday before the Houston Livestock Show and Rodeo (and related opening day parade) begins, Houstonians are encouraged to "Go Texan" by donning western gear. For many Houstonians, this simply translates to "jeans day" or maybe "jeans and cute boots" day. 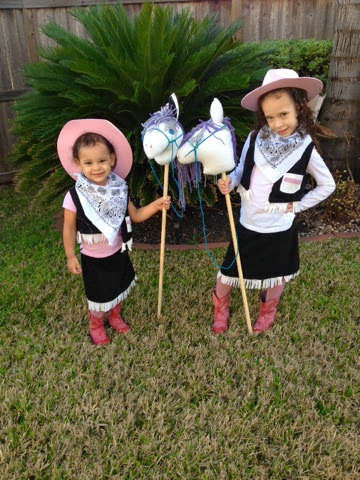 The Pop Culture Girls' school asks that parents make stick horses (instructions provided for those who need it) and that the kids dress up in western gear. They also celebrate Go Texan Day a full week before the actual day, for reasons that have never actually been explained to the parents. Last Friday was the girls' Week-Before-the-Real-Thing Go Texan Day. Last year, in preparation for WBTRT GTD, I sat on the floor of my living room for several hours hand-sewing stick horses. The horses were cute, no doubt, but my already bad back was killing me from hunching over for so long (my chiropractor was not happy about that), and my hands were cramped. I kept saying over and over that if I knew how to use a sewing machine, that process would have gone a lot faster. I've always known how to sew by hand (to some extent, anyway), but have always sucked at using a sewing machine. I always outsourced my sewing to my mom, who is pretty fabulous with a machine. She spent several years trying to teach me, but I usually just ended up breaking a needle or the machine or something. Funny, I could cross-stitch, latch hook, and hand-sew, but using a sewing machine? Forget it. So last year, fresh off my pain of all-day sewing to make two stick horses, I vowed I would learn to sew before Go Texan Day 2014. I told Pop Culture Dad that all I wanted for Mothers Day, my birthday (in June), and Christmas was a Hello Kitty sewing machine and sewing lessons. He complied. I had sewing lessons every Saturday in June (including one on my actual birthday). I kept going with and and kept practicing. I've definitely been getting better at it, and (so far) I haven't broken my machine! This year, in addition to the stick horses, I decided to tackle making western outfits for the girls. I was pretty successful with them, too, don'tcha think?